MASKerade: One Year Later - and a Challenge! One Year Later - and a Challenge! One year ago today, MASKerade started its journey through blogland. And what a year it's been!! It's been so much fun - the card making, the learning (both computer and camera), the design team work and best of all, all the new friends. I thank each and every one of you, whether you've been here once or come every day - it's been wonderful meeting you, being inspired by you and being encouraged by you (and even planning some little surprises together from time to time!). So in honour of this very auspicious occasion, I've decided to host a little challenge. Take the first card you ever posted to your blog (or flickr, or splitcoaststampers - wherever) and CASE it. If you think it's perfect the way it is and it can't be made any better (I didn't have this problem! ), you can choose any of your old cards that you do think could be changed or improved. Here's the very first card I posted on January 20, 2012. It was for Susan's One Layer Wednesday challenge - who knew then that this year I would actually be one of the hostesses of this challenge. This pretty pink, starry birthday card will be sent to my niece who lives just outside London, in the UK. I used the Martha Stewart 'anywhere' star punch and a Printworks sentiment. I hope you'll help me celebrate! Head back into those archives and dig out your "inspiration" for this challenge. No CAS or One-layer requirements. Whatever you like! Post the original and your remake and link up to the right. Happy birthday to your blog, Ardyth! So glad we met on this card making journey! I blush when I look at the first cards on my blog...perhaps this is the time to show what I've learned! Thanks for your visits and always kind comments! Ardyth, what a super fun challenge! I'm looking forward to playing along...love both your cards...all the pink shine is awesome. So thankful for your gorgeous blog. 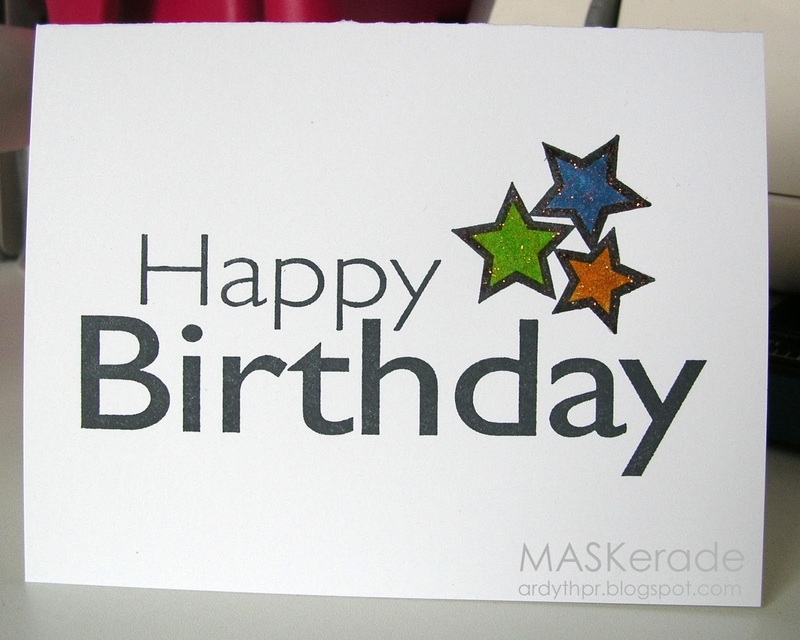 Happy Blog Birthday! I love the idea to case our first card - I'll be along later to play. it is not always possebel. Happy Bloggoversary, Ardy!!! The Spere is SO much better since you've been in it! Actually, I LOVE your original and I LOVE your remake. I wouldn't really say the second one was better since I like 'em both, but the second one sure is brighter and sparkier and your niece is going to treasure it. You are going to be known as the fun Idea Girl, among your other known qualities! This new challenge sounds super cool. I'm still sending thank yous for the anni wishes, but I'll be back to join in soons I can! Mwah! Your cards are always so original and fun which has helped land you some great DT gigs too. 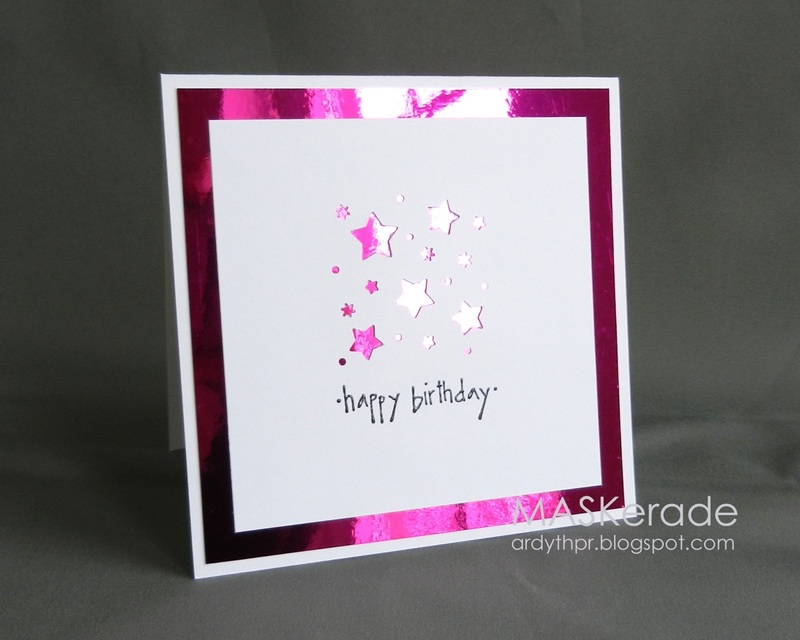 Love your starry pink birthday card... fun idea to re-do an old card.... hope to get time to play along too. A happy blogaversary to you Ardyth! Beautiful cards today too. Fun idea--I'll try to play along. congrats on your accomplishments! Happy blog anniversary! I've loved admiring your cards along the way. Thank you so much and I hope you have lots of fun. Love the CASEd card, the metallic pink looks awesome! Congratulations on completing the first year of blogging! Love your idea of celebrating it with a challenge! Well I guess I didn't realize we started around the same time ... neat! Happy blogoversary, Ardyth!! Love your original, love your CASE (especially those tiny stars ... is that a separate punch?) Great idea for a celebration. I'd like to play along if I have some time! Ardyth, I'm not sure I'm even game enough to LOOK at what my first card posted was...eek! I'll think about it, and perhaps come back with a remake, if I can get over the embarrassment, LOL! Oops, pressed enter before I finished! Congratulations on your one year anniversary! I've loved coming to visit over the year! Both your cards are great - first and re-do! Darn. You all are having so much fun just when I can't participate. Going south for the winter is a double-edged sword. I love being out of the cold but I can't take my craft supplies with me. I did go back and look at the first card I posted, almost 2 years ago now, and it wasn't that bad. Love your makeover! I was excited to see such a fabulous and simple card as today is my last day of procrastination on a birthday card for a friend. She is my one friend I can send horsey cards to, but she probably thinks that's all I can make at this point, ha-ha. So next year I will be back to your horsey inspirations for her. :0) Thanks a bunch! What a great idea, Ardyth! I just went back and looked and at least my photographing skills have improved! Hope I can get one done before you close up shop! Love those hot pink stars! congrats Ardyth on a year of wonderful cards, great challenges and inspiring creations! !